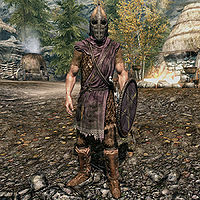 Shor's Stone Guards are guards that can be found in the settlement of Shor's Stone in the Rift. The guards are strategically placed in the small settlement due to the proximity of Fort Greenwall, located just south of town. Like the other guards of the Rift, they are allied with the Stormcloaks. If the Rift is conquered by the Imperial Legion, they will all be replaced with special Imperial Guards. All Shor's Stone Guards are equipped with Riften guard armor, matching helmets and shields, and fur boots. They are armed with hunting bows with 15 steel arrows, steel daggers, and iron or steel one-handed weapons. Additionally, each guard has a 50% chance of carrying a torch and a slim chance of carrying some food, drink or an amulet. One guards the entrance to Redbelly Mine. One patrols back and forth between the mine entrance and the nearby smelter. One covers the entire settlement. This page was last modified on 26 November 2016, at 04:12.